This past weekend in Chicago, the remaining core members of the Grateful Dead (Bob Weir, Phil Lesh, Bill Kreutzmann, Mickey Hart) performed three sold-out shows at Soldier Field. Joining the band for this historic occasion was Phish frontman Trey Anastasio, Bruce Hornsby, and Jeff Chimenti. Keep in mind, the super crisp A++ soundboard / matrix recordings will be available exclusively on the official releases from the band. 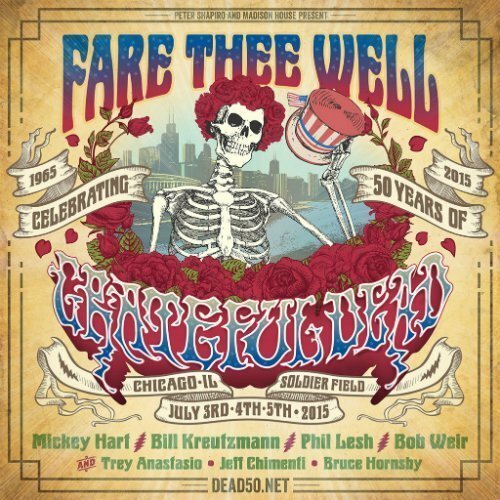 Fare Thee Well box sets are available for pre-order on Amazon (Blu-Ray, DVD, and CD). For the latest music and news about the Grateful Dead, check out their Zumic artist page.